Excuse me? THAT is how you entitle a “how the race went” post??? Really?!?!??? I know… all this buildup I was doing to the Bear Chase, and here you’ve been waiting on pins and needles wondering how it went. Okay, maybe not pins and needles, but still… I noticed that I had more visits to my blog the later part of yesterday when I didn’t post anything than I’ve had when I posted like crazy, and the only explanation is that there are some who actually are interested in how it went. And the day of the race comes and goes, and it’s mid day the next day and FINALLY, something shows up about how the race went. What is that supposed to mean anyway? You may know, I throw that phrase out here and there. I really don’t know what it’s supposed to mean. Maybe it’s just that: an I don’t know what that’s supposed to mean kinda thing. So maybe it’s fitting because I don’t know what to say about the race. I mean, I did it. And the race was awesome. It was an incredible day, a beautiful setting, it was one of the best supported races you could find, especially for a race that wasn’t made up of mega thousands of people, you know? And I think that’s why I don’t know what to say. I should be here gushing about all that was great. I’ve been building up to this thing for four months, writing all over the place about my training. So I know I was expecting to be able to rush back to my computer and say oh yeah, I killed it. 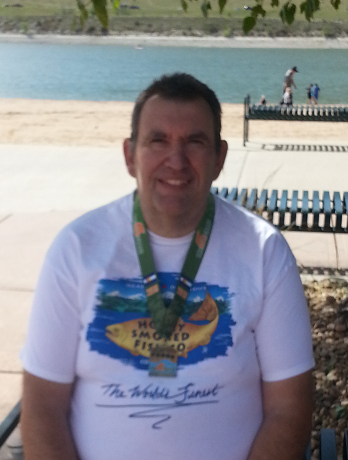 I know, I should be thrilled that I did 13.1 miles. Actually 13.5, even better right? And I did it on a particularly brutal course. But I didn’t do what I wanted to do. I walked a pretty significant portion of it. It took me four hours and 11 minutes. I know all the reasons I should be able to say yeah, but. There are enough of them. I was telling my brother about it and in the midst of it he was like wait a minute, you ran a TRAIL race half marathon? He called me a nutcase. He was right. This was no ordinary half. In fact they had to re-figure the route because big parts of the course were under water still, and that ended up making it a 13.5 mile course instead of 13.1. It had over 1200 feet of elevation change. This is what the trail was like for the most part. The trails were excellent for trail running. But here’s my problem. I didn’t train for trail running. I trained for normal, wide easy path kinda running. I wasn’t ready for this, and neither was my back. We ran in this park twice for our long runs, but we ran the pavement, not the trails. I think I even commented here before that I was a bit concerned about that part. 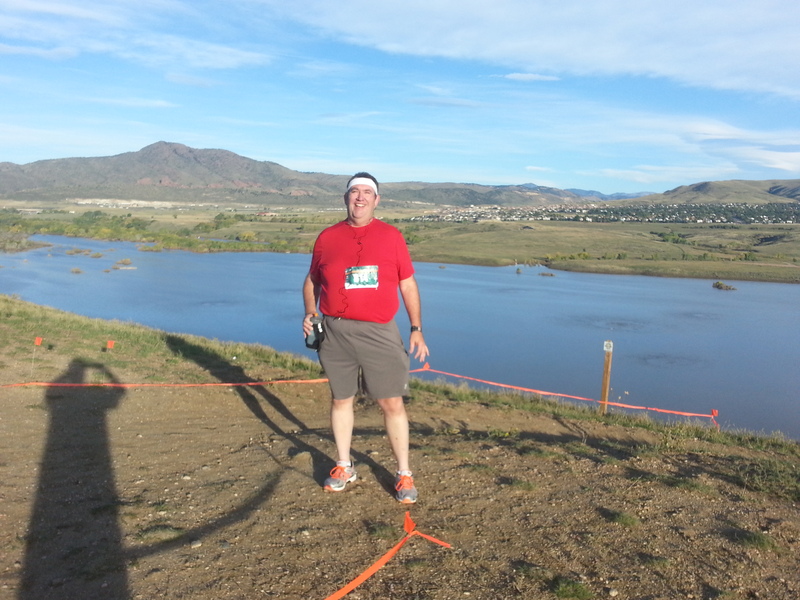 BUT… I didn’t do anything about it, I didn’t go run trails on my own even though i KNEW this was a trail race. And it started out pretty well. The first part was pretty good actually and I ran right at the pace I wanted to. We came to the water crossing early, and it was actually kinda fun. I was amazed how quickly my shoes dried out and very happy I decided to get decent socks after that point. I was thinking, do I try to wade through the shallowest end, or tip toe over the rocks? Oh heck no, I’m just plowing through! Honestly, those few seconds of just plowing through the water were some of the most fun I’ve had in awhile. And my spirits were pretty high for a good bit after that. I got to the top of Mount Carbon, the biggest climb of the course, about 140 feet in about 3/4 mile. On top of the world, or at least on top of Mount Carbon – the angle of the picture doesn’t really show it but the water there is about 150 feet below us. Coming down the hill afterwards was enjoyable too. Not so much that it was downhill but it was just beautiful. The pictures I took of how the path winds and weaves and switches back didn’t save unfortunately. There is one where the trail curves along the side of the hill and I’m thinking we need guard rails here. Definitely a no passing zone. It wasn’t long after that that I first uttered the phrase Love a Duck. Probably some other phrases too that I won’t publish. The trail started getting pretty rugged and it took some pretty major concentration just to keep from turning an ankle. And then the ultras came whizzing by. The ultra-marathoners started a half hour before us. We share the same 10 mile loop on the race – so for example the 50 milers ran that loop 5 times. 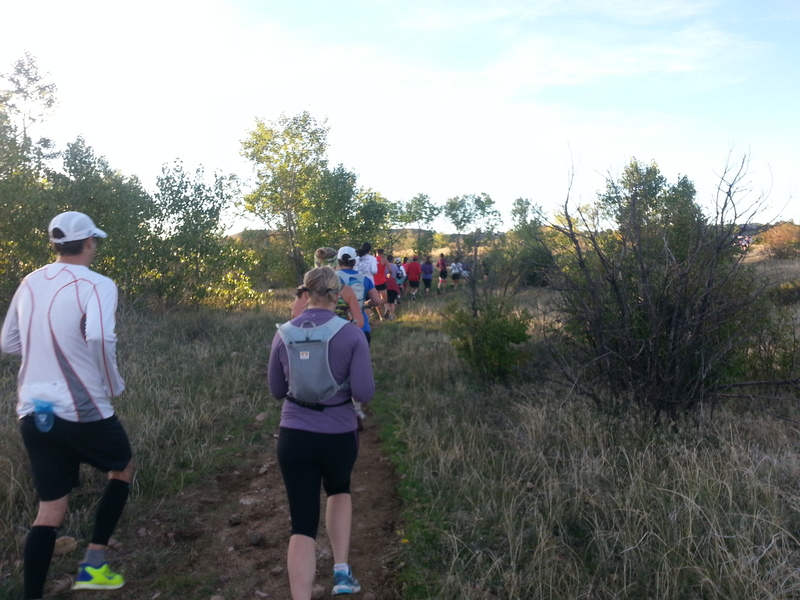 It was about the 7 mile mark that I got lapped by the first ultra runner. So when you’re on a really narrow trail and you hear someone coming up on you, out of courtesy you dodge out of the way. After 7 miles where some of the trail seemed just wide enough to fit my size 14 feet, and now this dodging in and out of the trail to make way for the ultras, that’s when my back declared oh hell no. I’ve talked on and off about my back being sore and yet how it’s fared really well while doing training runs. Well, my back was quite content with simple one foot in front of the other running. But after the dodging left to right and contorting over the rockier sections of trail and such, it was like my back said, no more. And so I walked from there on in. 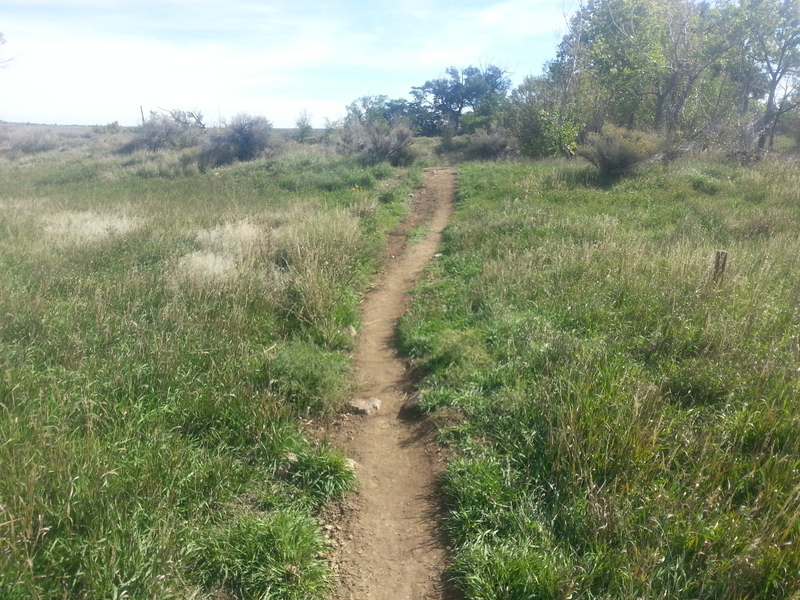 There were a couple of sections of wider trail where I tried picking back up to a jog… I don’t know, is it mental? I mean, walking I was fine. Jogging? Not so much. So I walked. It wasn’t like I was walking in a lot of pain, at least not if I didn’t try to push the pace too much. At times, it was a bit of a ginger walk. 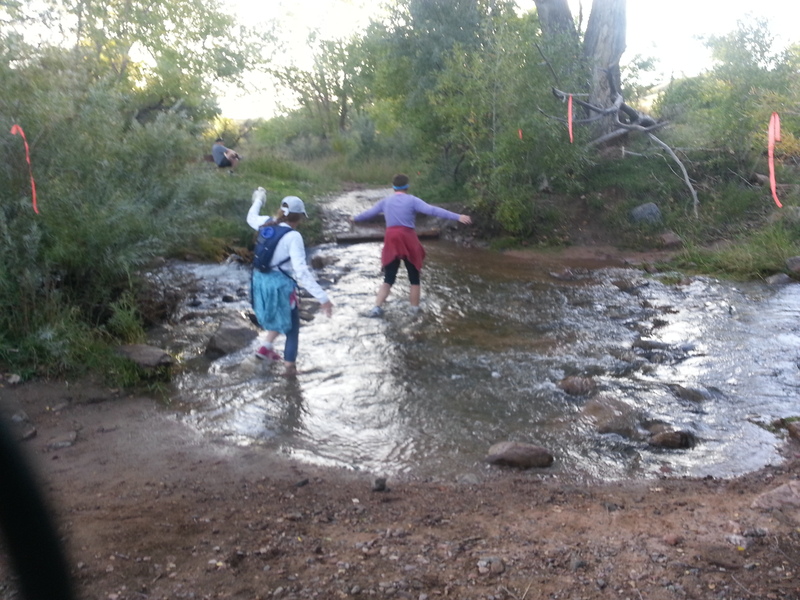 The good news is I had as much fun doing the water crossing the second time as I did the first. The water felt really good… I definitely contemplated just staying there for a bit. But I had a race to finish. Originally, they were going to do the ultra races on Saturday, and the half and 10K Sunday, but due to muddy conditions they moved the ultras back a day. Maybe that was a good thing because if they hadn’t made that change, they would have shut the course down at 11, meaning that at the time I was running, I’d have been swept. It would have been a big fat DNF. Though maybe without dodging out of the way for the guys who were lapping me, I’d have been able to keep up running a bit more? So who knows. So, I have every reason to be proud of the fact that I finished. Even with my back giving me fits, I kept on and finished. And honestly, I AM proud of that. Walk or run, it’s just such a huge thing to have come this far, to be where I’ve been in my health and fitness and coming this far to being able to do this. I guess it’s that realization though that has me at this “love a duck” place that I don’t know what to say. I should be proud, and I am proud. And the comments and congratulations from so many friends has been humbling and incredibly appreciated. And maybe my hesitation is that it seems dis-honoring to everyone to feel disappointed. When all is said and done, I can’t deny feeling that way. I know that it is what it is, I couldn’t have stopped my back from acting up. Maybe the disappointment comes from this thought that… maybe I could have? What it comes down to is this sinking feeling that I didn’t train properly for this race. If I had been training on trails, I’d have been better prepared for running on herky jerky terrain like that. I know that in the midst of the initial frustration when I realized I’d have to walk it in, I was really frustrated. I was cussing the choice of the race, I was cussing the training program. There was sort of an epiphany in that though, when I was in the midst of this big pity party I was thinking dammit, all along I was saying we should be running trails, why aren’t we running trails and it was almost like some voice is saying so, why weren’t you? I wanted to blame everyone else but it hit me between the eyes… if I knew it all the time, why didn’t I do something about it? I think there was some naivete in thinking it really wouldn’t be that different (admittedly, I WAS very surprised just how different it was)… but the reality was, the only one to blame for this was me. And that’s where the frustration lies. I knew better. I didn’t do better. It was a good thing though that the realization came. It dawned on me, I can’t change it now. Why beat myself up now? (Save it for when you’re writing on the blog, right?) Why be miserable for the last few miles of this? And at that, I think I let it be fun. I have to say… I love the ultras! Okay, so maybe part of my problem came from dodging out of their way, and I really wanted to be jealous of the fact that here they were, 18-20 miles into their run and running faster and fresher than I could at the start of the race. But they could have been frustrated at this big guy trudging along the trail in front of them slowing them down. And yet… here they were congratulating me, encouraging me, giving me high fives. I think that really helped pick up my mood and it became as much about cheering them on as they go whizzing by. How the heck can you run with that much energy and pep after nearly 20 miles on a pretty brutal course anyway? In the end, I got my medal. When it’s all said and done, I EARNED that puppy. Not sure yet where I’m putting it, but it will be displayed with pride. I think that ultimately, the main reason that the best way I can describe how I feel about this race is “love a duck” is that there is such a dichotomy to how I feel. I DID IT!!! And for the most part I had a blast. I took time really enjoying what was going on around me, the weather was the most perfect it could have been, and I’m proud of what I accomplished. At the same time, there is this this understanding that my disappointment is my own fault, that the feeling I should have done many things differently is very legitimate. Both feelings are very strong, though very at odds with one another. That’s why it’s taken awhile to post because really, what do you say? It seems almost wrong to write of disappointment when you’ve knocked out something you never thought you could knock out. But it’s very disingenuous to pretend the disappointment isn’t there. I’ve tried to be transparent here, and I can’t change that now. So how else can you really sum it all up? This entry was posted in Uncategorized and tagged Bear Chase, half marathon, Love a Duck, Mount Carbon, Race Result, Trail Running, Water Crossing. Bookmark the permalink. Thank you. I don’t know that I’d go so far as calling it finishing despite having an injury. I almost want to say it wasn’t an injury, more a lower back muscle thing that just wanted to flare up when I was running. I guess you could call that an injury. But it wasn’t a matter of pushing through an injury because when I was walking it felt fine. I have to think most would have finished just fine in those circumstances. Congratulations! You finished! To me, that is the most important thing: you set a goal to participate and went out and did it. 🙂 I’ll be doing something similar on a much, much smaller scale next month at my university’s Homecoming–they are having a 5K/1 mile fun run and I’m opting to participate in the 1 miler. Baby steps, right? Keep it up…you’ll be doing full marathons before you know it.